Urge your rep and senators to co-sponsor and support the bipartisan War Powers Resolution S.J.Res. 54 sponsored by Sens. Bernie Sanders (D-VT) and Mike Lee (R-UT). The privileged resolution would end U.S. military involvement in the Saudi-led war in Yemen. This award-winning video explains what mainstream media will not, because they are tied too closely to the war machine. Veterans For Peace (VFP) is dedicated to eliminating war as an implement of foreign policy and to that end, works to educate the public about the true costs of war. 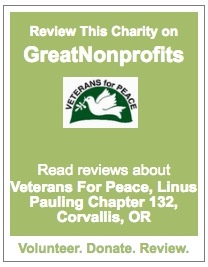 Veterans For Peace (VFP) Linus Pauling Chapter 132 is a chapter of Veterans For Peace, St. Louis, MO, which has been waging peace since 1985 and is an NGO recognized by the United Nations. The local chapter and the national organization are both 501(c)3 non-profit organizations. Veterans For Peace is made up of veteran and associate members. More information about the national organization, including our Statement of Purpose and contact information for a VFP chapter near you, may be found at: www.veteransforpeace.org. This entry was posted in Peace Activism. Bookmark the permalink. Release Marine Jose Segovia Benitez from I.C.E. Corvallis Film screening, discussion–Abolish Nuclear Weapons!